Foreign language requirements vary from school to school, and the exact requirement is often not clear for any individual school. For example, is the "minimum" requirement really adequate? Do language classes in middle school count? If a college requires 4 years of a language, does a high score on the AP fulfill the requirement? In general, competitive colleges require at least two years of foreign language classes in high school. As you'll see below, Stanford University would like to see three or more years, and Harvard University urges applicants to take four years. These classes should be in the same language—colleges would much prefer to see proficiency in one language than a superficial smattering of several languages. When a college recommends "two or more" years of a language, they are clearly signaling that language study beyond two years would strengthen your application. Indeed, no matter where you apply for college, a demonstrated proficiency in a second language will improve your chances of being admitted. Life in college and after college is becoming increasingly globalized, so strength in a second language carries a lot of weight with admissions counselors. That said, students who have just the minimum can win admission if their applications demonstrate strengths in other areas. Some less competitive schools don't even have a high school language requirement and assume some students will simply study a language once they get to college. If you score a 4 or 5 on an AP language exam, most colleges will consider that evidence of adequate high school foreign language preparation (and you're likely to get course credit in college). Check with the schools to which you apply to find out exactly what their Advanced Placement policies are. Which Foreign Language Is Best? In general, colleges want to see foreign language proficiency, and they don't really care which language you study. Most students, in fact, have few choices. Many schools offer just a couple languages such as French and Spanish. That said, it can be a plus if your study of a foreign language aligns with your career goals. German and Chinese are both valuable languages for students interested in business, and strong French skills would be ideal for someone who wants to teach English or work in public health in Francophone Africa. In 2018, when Harvard University's Dean of Admissions testified in court about the school's admissions policies, he revealed that students who studied Greek and Latin and showed an interest in the ancient classics had a slight edge over many other applicants. On the whole, however, study the language that you are most interested in learning. Let your passions guide you. Where would you be most interested in traveling? What language is most likely to intersect with your future plans? If you might study abroad, where would you go? The table below shows the foreign language requirement at several competitive colleges. Keep in mind that 2 years truly is a minimum, and you will be a stronger applicant at places like MIT and the University of Illinois if you take three or four years. Also, it's important to understand what a "year" means in the context of college admissions. If you began a language in 7th grade, typically 7th and 8th grade will count as a single year, and they should show up on your high school transcript as a unit of a foreign language. If you take a true college class at a college, a single semester of a language will typically be the equivalent of a year of high school language (and those credits are likely to transfer to your college). If you take a dual enrollment class through a collaboration between your high school and a college, those classes are often a single-semester college class spread out over the course of a full year of high school. If you're a high achiever and want to graduate from high school with three or four years of language classes but your high school offers only introductory-level classes, you still have options. First of all, when colleges evaluate your high school academic record, they want to see that you have taken the most challenging classes available to you. They recognize the significant disparity between schools. If upper-level and AP language classes simply aren't an option at your school, colleges shouldn't penalize you for not taking classes that don't exist. Taking language classes at a local community college. You are likely to find evening or weekend courses that work with your high school schedule, or you may be able to take an early morning or late afternoon college class during a high school class period. Taking online language classes. If there is no college in your area, you can find many options for online college language classes. You may even be able to get high school credit for an online college course. Ideally you'll want a course that includes audio or video conferencing so that you can develop the listening and conversational skills that are so important to language learning. Be forewarned that many colleges will not transfer language credits earned online. Self-studying to take an AP language exam. There are lots of programs out there such as Rosetta Stone, Rocket Languages, and Babbel that can help you learn speaking, reading, and writing skills. An AP study guide can help guide your self-study so that you are targeting material that is likely to be on the exam. 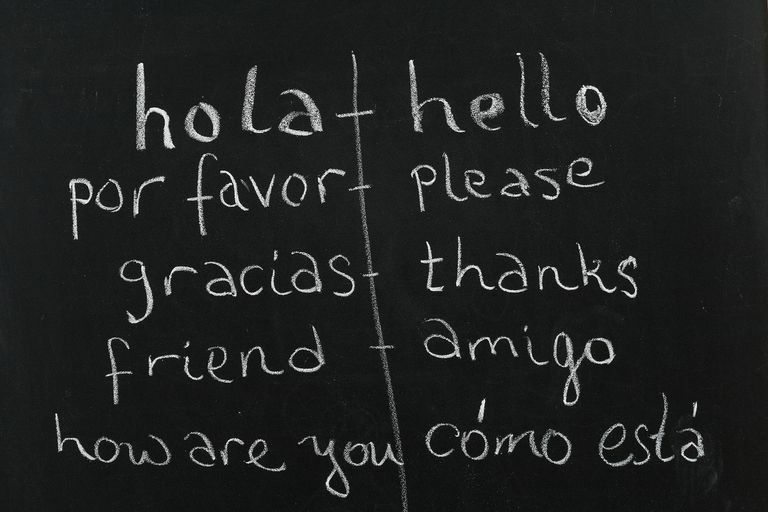 Travel that immerses you in a foreign language can also be extremely beneficial. Ideally you'd want to take the AP exam your junior year so that you'll have the score in hand when you apply to colleges. Earning a 4 or 5 on the exam (and perhaps a 3) is a convincing way to demonstrate your language knowledge. Note that this option is only good for self-motivated students. If English is not your first language, you most likely won't need to worry about foreign language courses as part of your college education. When a student from China takes the AP Chinese exam or a student from Argentina takes AP Spanish, the exam results aren't going to impress anyone in a significant way. For non-native English speakers, the much bigger issue will be demonstrating strong English language skills. A high score on the Test of English as a Foreign Language (TOEFL), the International English Language Testing System (IELTS), the Pearson Test of English (PTE), or a similar exam will be an important part of a successful application to colleges in the U.S.
As you consider whether or not to take a foreign language in your junior and senior years of high school, keep in mind that your academic record is almost always the most important part of your college application. Colleges will want to see that you have taken the most challenging courses available to you. If you choose a study hall or an elective course over a language, the admissions folks at highly selective colleges won't view that decision positively.